Daleys Fruit Tree has Plants for Sale to Mcgraths Hill and can Mail Order them to you door. Click to Find out how much Freight Will Cost. The small oval fruit is a brilliant deep orange colour with a highly aromatic skin. The fruit holds on the tree for a long period adding to its high ornamental value. 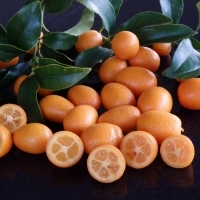 It can be eaten whole as a fresh fruit or in the same way as other kumquats.